Note: This is for firewalls running an operating system BEFORE version 7, if you have an PIX running version 7 or above go here instead. 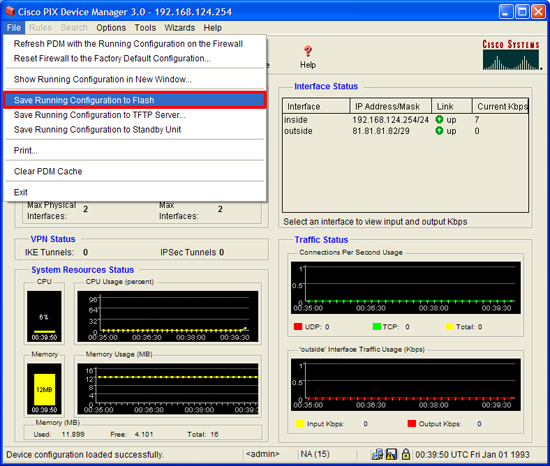 I’ll run though he commands first and then the configuration from PDM at the end. 2. I’m assuming the network BEHIND the PIX 500 is 192.168.124.0/24 and the network at the far end of the tunnel is 192.168.123.0/24. So I’m going to create two ACL’s one to tell the PIX that this traffic should be encrypted, and the second to tell the PIX NOT to perform NAT on the VPN traffic. Note: Yes I can use one ACL, but having two makes it easier to troubleshoot any VPN problems. 3. Now I’ve got an ACL that will stop performing NAT I need to add it as a “Nat 0” (this means don’t perform NAT). SAME ACL that is already in use. 4. To set up all the VPN parameters you need to create a crypto map. 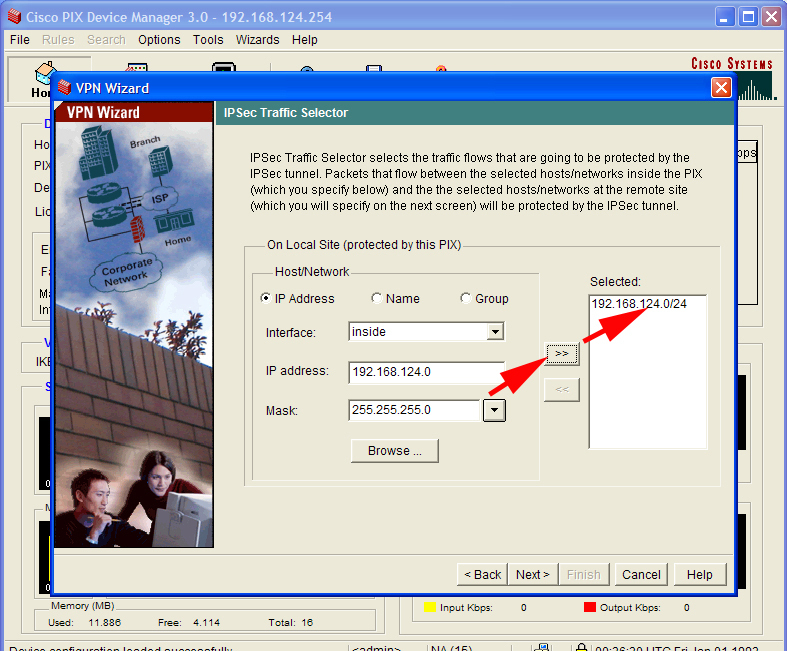 In the example below I set the peer IP (the firewall at the other end of the tunnel), to 81.81.81.81. Then I tie it to the ACL I created earlier (VPN_CRYPTO_ACL). I’ve set the encryption and hashing used for the tunnel to 3DES and SHA (These will be used for IPSec (Phase 2)). Set the timeouts for the tunnel, and finally apply the cryptomap I’ve just created, to the outside interface. 5. The next command lets VPN traffic bypass any other ACLs configured on the firewall. 6. I’m using a “shared secret” that also needs to be setup on the other end of the tunnel. 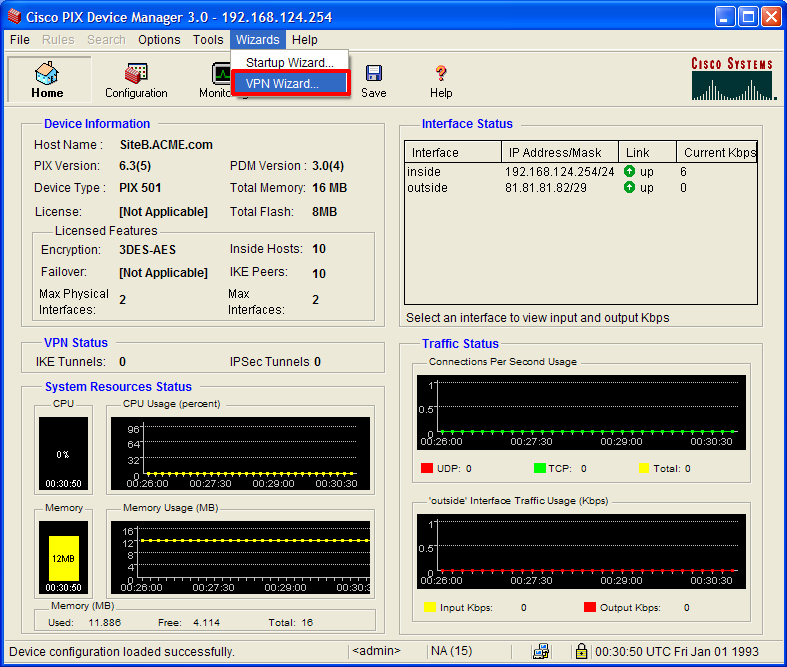 As I said earlier the peer IP is 81.81.81.81. 7. To establish the VPN phase 1 (ISAKMP) the devices at both ends of the tunnel need a matching ISAKMP policy. I’ve already set up my shared secret, the first line lets the other end know that’s how we will be communicating. Then once again I’m using 3DES and SHA. I’m telling the system to use Diffie Hellman group 2 for the secure key exchange, and then binding this policy to the outside interface. 8. Then save the changes with a write mem command. 1. To connect to the PDM you are going to need two things, an OLD browser (IE6) and an OLD version of Java (This Java will get you access). Select Wizards > VPN Wizard. 2. Site to Site > Next. 3. Set the Peer (Device at the other end of the tunnel) and a shared secret that you will also use at the other end > Next. 4. Set the policy that will be used for phase 1 > Next. 6. Enter the network behind the PIX > Next. 7. Enter the network at the far end of the tunnel > Finish. 8. Finish by saving the changes > File > Save running configuration to flash.